For your own parental sanity, it is so important to have a list of go-to inside activities for high energy kids. You know, ways to burn off energy. Mounds and mounds of energy. I turn to this list ALL THE TIME. When I don’t feel well and I need to keep my kids from crawling all over me (seriously, why does this happen?). When it’s too cold to play outside for the 47th day in a row. When they can’t seem to get along. When they want to watch ANOTHER episode of Paw Patrol. When you wonder how to burn energy before bed because your kids ONLY go to sleep easily at night if they’ve been really active that day. I mean really, add up all of those scenarios and this list could come in handy just about every minute of every day! 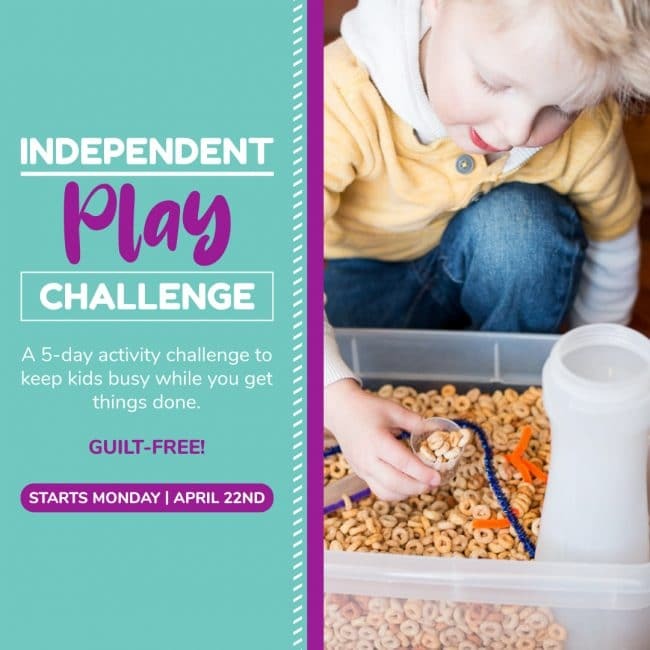 The lovely Jaime from Hands On As We Grow has a free 7-day indoor activity challenge. 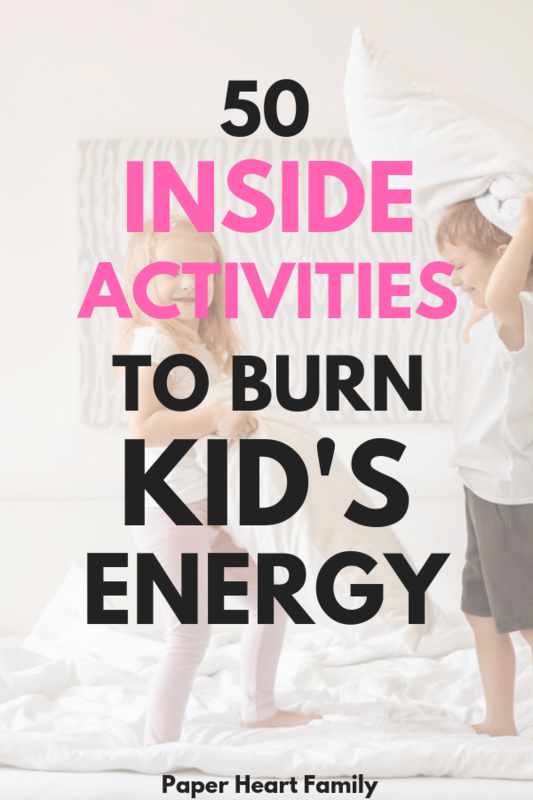 (My kids and I have done this challenge 2 years in a row now, and Jaime always comes up with quick, low-prep ways to get kid’s energy out indoors that I’ve never heard of before. Sign up here! We have a couple indoor games for kids: The Disney Jr Super Stretchy Game and Dr. Seuss I Can Do That! Game. My kids love both of them (and they are a big hit with their older male cousins when they come over too). Both are really fun physical games to play. The Super Stretchy Game is like Twister for kids. I also love it because it reinforces shapes, colors, and left and right for younger kids. The I Can Do That! Game is a card game that gets your kids to attempt some silly things while carrying a foam fish. Things such as “crawl to the fridge with the fish on your head” or “jump to the bathtub with the fish between your knees”. Leap frog will quickly raise your kid’s heart rates (and quickly tire them out for an earlier bedtime). I think dancing with my kids might be one of my most favorite ways to be active with them. The beauty of a spontaneous dance party is that it can be done anywhere and anytime! You can make anything into indoor games for kids and your kids with love it. Even cleaning! If there is a specific room of the house that needs to be picked up, one of my kids picks a song and we try to clean up the whole room before the song is over. I LOVE this because they clean FAST. If I just ask them to clean the room without playing the cleaning game, it take them approximately 5.9 hours to get it done. I love this for toddlers and preschoolers who are learning their letters (you could also do this with whatever your child is learning- addition, subtraction, sight words, etc). Simply hide flashcards around the house, and when your child finds it, she must say what the letter is. Get creative and use whatever you have (a crib mattress, pillows, blankets). The object is to avoid touching the floor (hot lava). Shark Attack is a fun variation on the hot lava game and another one of our favorite high energy kid games. The pillows are now boats and mom (or dad) is the shark in the water. One person acts as the leader and everyone else copies whatever the leader does (this could be a great workout for mom if you incorporate some down dogs, planks, jumping jacks, or even a couple dreadful burpees). Keep it simple with this. Have a start line that your kids must stand behind, and then have them throw their planes to see which one goes farther. You could even have them take a running start if you have space in your home. Do you have an old crib mattress in your basement that you have no idea what to do with? Bring it out, prop it up on the couch and sit back while your kids slide down it for hours. I bet your kids will come up with other uses for it too! Time your kids and see how fast they can find 5 things of a certain color throughout the house. We have an unfinished basement and in the winter, many of our outdoor toys are kept down there (bikes, scooters, little tykes roller coaster, indoor slide, roller skates, etc). You could also keep these toys in your garage. 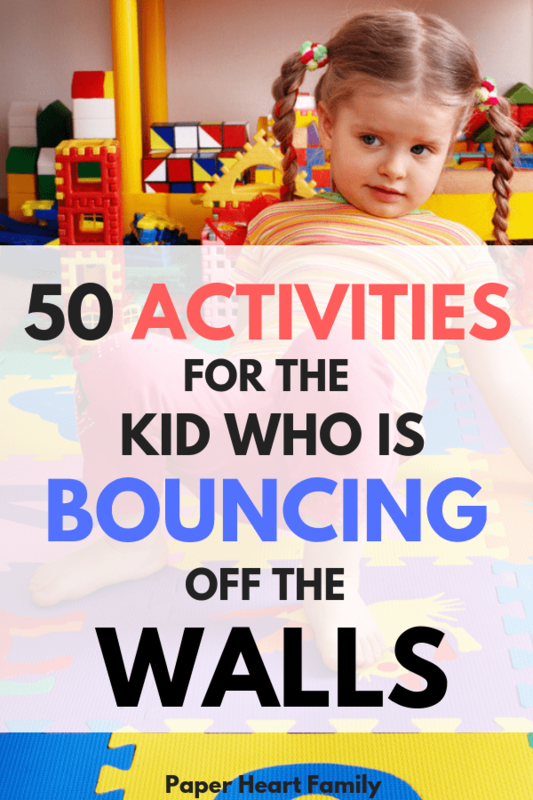 While this isn’t the most active activity on the list, the actual building of it is pretty physical, and whenever we build a fort my kids usually spend all day running in and out of it. While my kids love forts, I find them frustrating because I usually spend all day having to help them repair it. For Christmas, I bought my kids the AirFort and it has been a HUGE hit. Write different activities on paper and tape them throughout the room (10 jumping jacks, 15 toe touches, 20 bridges, etc). Time your kids to see how fast they can run to each station and complete the activity. You can play this over and over and have your kids try to beat their personal best time. Music is a great way to move, but interactive music is even better! ✔️I Know A Chicken (this one is best if you have something that your kids can shake. ✔️The Banana Dance- If you’ve never heard this one, you MUST check it out! A fun twist on the scavenger hunt. Hide some objects of your choice in a dark room, and then your kids need to find them using flashlights. An oldie, but a goodie! This is another one of our favorite ways to burn off energy. This is an activity that my kids invented. Older kids can roll themselves back and forth on an exercise ball. For younger kids you will need to hold their ankles and push them back and forth. It’s also fun to place an object in front of the ball that your child has to try to grab. You can absolutely play Kick The Can inside. The game starts out like Hide And Seek, then the “hiders” need to try to sneak out and kick the can before they are tagged. We don’t exactly follow the traditional rules for this. Each team has a flag that they must hide on their side of the room. Then players try to be the first to capture the other team’s flag. If a person is tagged, they must return to their own start line. Hide-And-Seek, but in a dark room. Remember jumping on the bed as a kid? It’s a GREAT way for kids to be active and have lots of fun at the same time. There’s a good chance that your kids will join in! Arm your kids with an extra large shirt and 2 pillows stuffed inside it. Now they can wrestle without (hopefully) getting injured. Get a parachute (a flat sheet works too) and fill the center with ping pong balls or small stuffed animals. Have your kids stand on one side of the room and write the alphabet (or whatever your child is learning) on a surface on the other side of the room (an easel, for example). Give your kids each a marker, and have them race over and try to be the first to circle the letter that you shout out. You could also do this individually if you don’t like the competition aspect. Fill a tic-tac-toe grid with different actions (run like a cheetah, slither like a snake, etc). Your child must complete the action before putting her X or O in the space. Create a big, soft pile using pillows, blankets, stuffed animals and anything that’s soft for your kids to jump into. Have your kids use their dress-up clothes to put on a parade for you. Our favorites are the Little Tykes slide (which still gets play by my 6 year old), a hula hoop, mini-trampoline, roller skates, a tumbling mat, ball hoppers, piano mat and a pogo jumper. 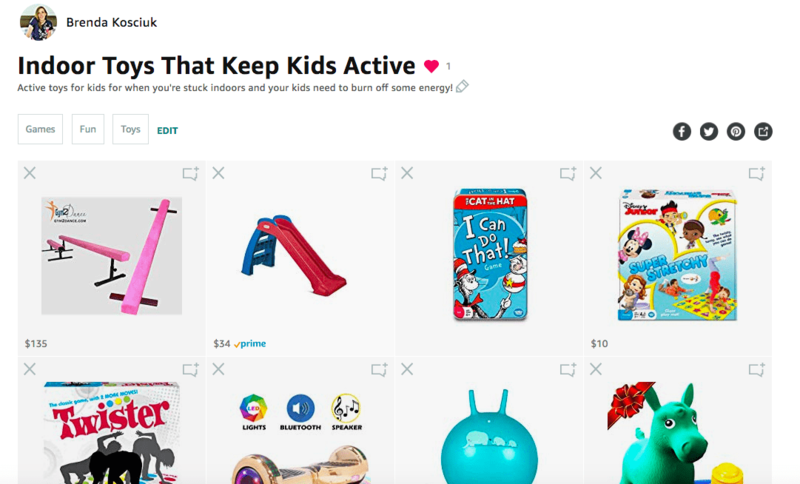 Check out the BEST Indoor Toys That Keep Kids Active List on Amazon here. You think I’m joking, right? Give your kids rags and a spray bottle filled with water (or a bowl) and they just might clean the whole floor for you. Hang a balloon on a strong from a doorway and make it a little bit out of your child’s reach. Kids (especially boys judging by my middle school students) will love this game. You can count how many times in a row they can hit it. You can easily play indoor hockey with your kids using pool noodles and a balloon. Put marbles at one end of the room, and a container at the other end. Your child needs to pick up the marbles using their toes and somehow transfer them to the container. They can crawl, hop, crab walk, etc. Kids love to be the center of attention. Have your kids put on a dance show, a trick show, talent show or whatever! Have them practice in a different room before the performance (which will give you a few moments of peace). This is another favorite in my house. Relays are really fun fitness games for kids. Your kids will race from one side of the room to the other in different ways (walking sideways, crawling, hopping, doing the wheelbarrow, etc). Charades can be played without any prep work at all. Simply call out a category (family members, animals, actions, etc) and have your child silently act out something from that category. I love Simon Says because it combines physical and mental activity. My kids love taking pillows and making a “pool” or a “nest” out of them that they can play in. You can create your own hopscotch using painter’s tape on the floor (or on the back of your yoga mat!). You could also get one of these hopscotch mats. Great for hand-eye coordination, see how long your entire family can keep the balloon up in the air. I bet there are many things around your house that you could use in order to create your own obstacle course (think tunnels, chairs, pillows, etc). You could make your obstacle course even more challenging by making a Tape Obstacle Course. Improve your child’s balance while you have fun with some fun exercises for kids. These are fun physical games to play. Lay a ladder down and prop one side up with a pillow. See if your child can walk across. What are your favorite inside activities for high energy kids? 21 Fun Ways To Document Your Pregnancy- Make Your Pregnancy Memorable!